It is well suited for mid-size companies to have a budgeting, forecasting, and reporting platform. The system needs data and someone to maintain it so it would not be well suited for a small company or one without a dedicated finance team. I would recommend, provided accounts payable will be running on their own system. SunSystems doesn't seem to work well for AP and/or purchasing. Financial Reporting - Building financial statements in OfficeConnect is a breeze! They are quick and easy to update on a monthly basis! The HTML reporting within Adaptive Insights is also particularly useful for department and adhoc reports! 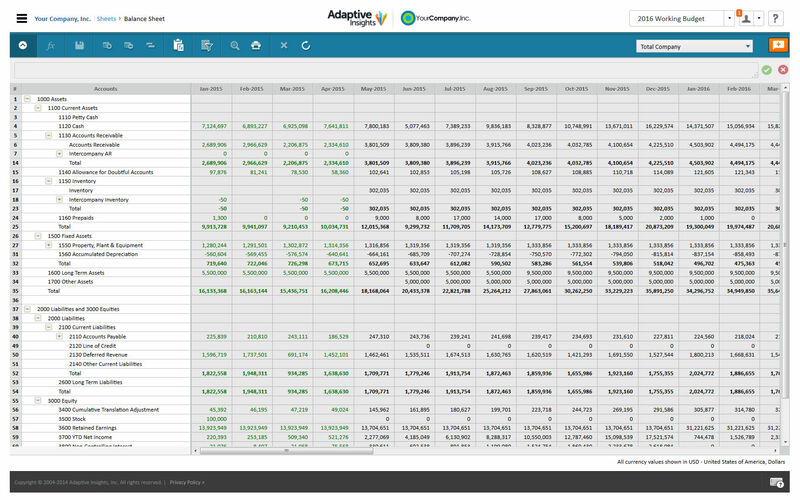 Budgeting/Forecasting - Being able to budget/forecast within Adaptive Insights has significantly cut down on the time it takes to budget by utilizing formulas and assumptions within the model! We reforecast quarterly, and with Adaptive Insights, it's painless when compared to the Excel forecasting we did previously. Cash Flow Statement - Creating this for the annual audit was painful before Adaptive Insights! Now, it's a simple export from Adaptive Insights. Dashboards - The dashboards that can be created are endless and provide valuable insight for our executives in real-time! Integration options are very good. We are able to import data in a number of ways and extract data as well. The use of their built in API for data validation, extraction and entry is working very well for us. The layout of the various reporting options could be displayed in a more user-friendlier way. It's a bit difficult to locate where to find the reports. I'm finding that the drill down feature from the monthly financials section is not as convenient as it should be. The exporting to Excel or PDF format is a bit off - it's time consuming to manipulate the excel to a regular paper size. Stability seems to be an issue. Installing patches almost always seem to fix some things and break others. Intuitive and Easy to MaintainThe Adaptive Suite is a very reliable Corporate Performance Management Solution. The solution is very easy to.use and provides timely, quality reporting. We have used the solution continuously for six years and been very pleased with the ongoing enhancements. Beyond our own positive experience we support many clients across commerce, industry and government. Nearly all our supported customers provide very positive feedback and continue to renew their subscriptions. Building complex reports is still difficult to do when using dimension or level attributes. Formulas are still a challenge. Support requests are always handled promptly and resolved favourably.Many user support requests arise during initial deployment and use and often represent questions relating to best methods or how to approach their particular situation, which we gladly assist with as we provide the appropriate skills transfer training and assistance.As clients become more knowledgeable in working with the product suite then they tend not to ask many questions. My decision came down to Adaptive vs Host Analytics. Host made the claim that because their sheets were just like excel, you wouldn't need to learn any new commands. Rather, I thought that was a downside. I didn't want another glorified version of excel, I was looking for something different, something new. Adaptive had that. They were also far more willing to work with a nonprofit and become a partner, rather than just a vendor. More functionality, better integrations, better reporting. Adaptive is the leader and is very progressive with the product improvements that they provide. Significantly decreased our budget cycle time. Fewer hours dedicated to running multiple excel scenarios for the budget season and more time spent assessing the overall assumptions/inputs. Reduced our month-end reporting cycle to 2 days with forecasting ready.